The photograph has only a circled handwritten number on the back of it, 90. 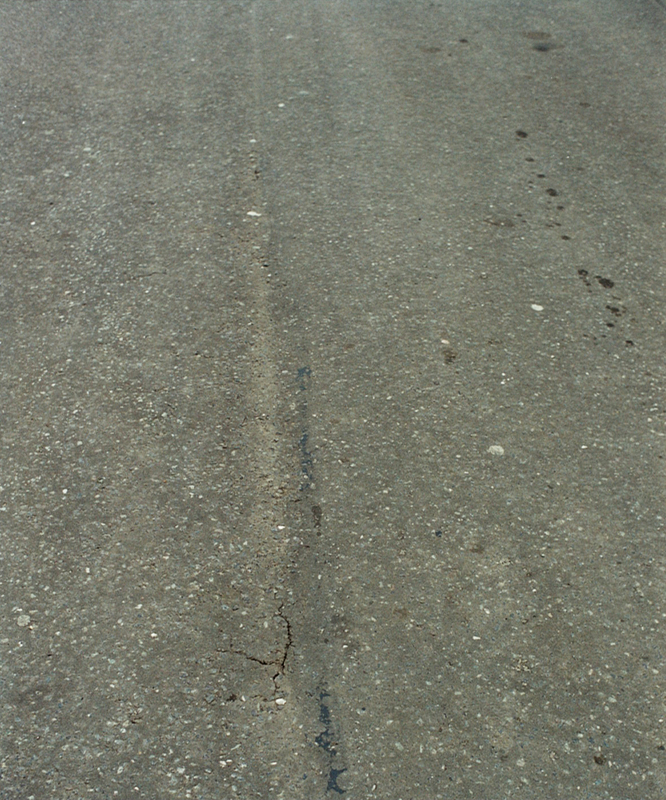 There’s nothing particularly striking about the image itself, its main feature being a rough hewn crescent-shaped crack, worryingly close to a worn line running up the pavement and off into the short distance. There’s a dynamic to these strokes cooperating with the perspective’s slight angle, a leaning in that anticipates us walking forwards, chins tucked into our chests. What’s caused the crack could be any number of infrastructure or random objects lying just beneath: telephone cabling, plumbing pipes, debris from the former train junction at this site, WW2 bomb shrapnel. No. 90 sits with 113 other similar shots, a numbered and sequenced stack of glossy 6x4s tucked away in a yellow 1 Hour Photo Service envelope with the handwritten note, ‘Fitzpatrick 99/2000.’ No. 36 is a late afternoon photograph of a pebble-strewn curb corner, one part of its lip pulverised to a chalk-like smear of a ramp. No. 19 is a brick-paved sidewalk, an indent in the brickwork aligned almost identically to the composition of no. 90, the sand-filled fault making an almost Aztec zig-zag design. No. 49 features three shrivelled up brown autumn leaves scattered tastefully over a set of paving slabs, one of them resting on the asphalt that has been used to fill the gap left by a missing half of a cracked slab. A warm yellow evening sunlight runs through an adjacent fence, crossing the image with a bracing slant of stripes. It turns out the packet of 114 photos was given to Elaine Bailey, after some works were completed early in her days as the manager of Poplar Business Park, in addition to the paperwork, paraphernalia, and hundreds of other shots she inherited in taking on the job in 1997. The park was first occupied in 1988 after over a year’s construction, at that point owned by the Port of London Authority, with some of its first tenants including the London Docklands Museum, and the Dockland Light Railways offices. A natural organiser and amateur historian, Bailey took on the images with zeal. The 114 photos, documentation of a series of telecoms and expansion work going on around the park in 1999, Bailey sorted, and then numbered. Two photo albums covered in blue plastic with that imitation leather effect, each of them with ‘Poplar Business Park’ hand written in gold on the cover of each, are also filled with snapshots of the park as it was being built, of its empty units ready for occupation, a few rare images of grinning contractors. “When I started to sort out the documents at PBP,” she remembers, “I came across the photos of the construction and thought they should be given a proper home, hence the photo albums. I continued to add to these during my time there, taking photos as and when needed to record changes, incidents or anything else I was interested in.” Bailey’s photos and those preceding hers have a remarkably similar tone, whether that’s by dint of the nature of the park and its day to day occurrences, or by the fact of Bailey’s eye in choosing and arranging the collection. What Bailey was ‘interested in’ was simply the park itself, whether underground pipes being dug up, or the fences on what were once empty lots on all other sides of the park. There are a few vantage point landscape shots from (the now doomed) Robin Hood Gardens estate next door: beyond the three rectangles of the business park we can see Billingsgate Market, and in Canary Wharf only the pyramid-tipped One Canada Water stands on its own, unchallenged in height. Another shot looks towards the miniature-nuclear-cooling tower of the Blackwall Tunnel ventilation shaft, sitting next to Richard Roger’s Reuters building, his Millennium Dome just across the bend in the Thames. By 2007, a development of the Radisson Hotel and another set of riverside ‘penthouse’ flats further transformed the area, and a 36 storey ‘luxury’ apartment block had opened up in the dirt lot in front of the park: there’s a series of warm, stunning sunset views from its roof. What might already be clear is that the business park sat just within a dynamic nexus of one of the most developed areas of London, currently undergoing its fourth facelift and major reconstruction within the span of a century. It was, from the beginning, implicitly tied to these changes, initiated alongside the DLR’s Beckton extensions eastwards. This was, of course, part of a wider plan: in 1982, the mangled and supposedly hopeless Isle of Dogs was the eighth area in the UK to have been granted the status of Enterprise Zone, Thatcher’s business-frothing incentive that has recently been rekindled as a strategy: no rates, and a breeze of planning permission if you’ve got the cash. The Isle, still bearing pockmarks from the Blitz, was to follow fellow Zones Corby, Wakefield, and Hartlepool into economic glory. We can now witness the results, though whether the policy was successful or not depends on who you ask. For Bailey, it was an adventure of a lifetime: more interesting than the plotting of the policy is her own involvement in this history; in addition to her photo albums of the park, Bailey had a number of aerial photographs of a desolate Canary Wharf, her peeking out from the cabin of a helicopter. She began as a temp at the London Docklands Development Corporation in 1986 and stayed as part of the ‘High Technology Team’, helping to market Docklands to VIPs with air, boat and road tours. I imagine her accompanying George Iacobescu on a grey, windy late afternoon tour over the half-submerged peninsula, yelling politely over the helicopter’s buzz, ‘You can see all the potential!’ Bailey then began work as the LDDC’s Business Grants Officer, implementing the 1978 Inner Urban Areas Act across several borough in the ‘Four Areas of Docklands’: Surrey Docks (Southwark), Royal Docks (Newham), Wapping and Isle of Dogs (both Tower Hamlets). She, of course, has another blue photo album, a black home-made embossed label ‘Docklands’ on its spine, of her time there—from Christmas parties, to the capping ceremony of Canada Water, to the aftermath of the South Quays bombing just down the street from her office. By the time the LDDC had fully wound down, Bailey was in Poplar, managing the Park from January 1997 for 16 years, retiring in July 2013. What her informal history of the area attests to is not only a personalised mapping of a particularly tempestuous part of London property history. It’s something in addition to simply managerial overviews, insurance claims, and budgetary concerns. Both she, and the unknown photographers before her, recognised the actual needs of the machinations of the policies, developments and shifts going on around them: to be a custodian, who must implement and document, without any moral agenda or political persuasion. Theirs is the ethic of the engineer, and I see Bailey as a curator, in the classic sense of the word, of that ethic. Inconsequential as each instance might seem, their collection and care allows us to understand the corresponding necessities to notions like the ‘Enterprise Zone’, the shaping of its spaces and facades over time, and perhaps glimpse its tectonics. No. 90 is one moment in a teeming layer of forces, when we can see the accrual of history begin to break through the surface. It asks us to look closer, and deeper. Poplar Business Park, currently under ownership of Workspace Ltd, has received permission to redevelop its land; next year, a third of its property will be converted to apartments, while all offices and light industrial units will be shifted to the remaining space. Elaine Bailey is planning to donate her photographs to the Museum of London Docklands. Chris Fite-Wassilak is a writer, curator and critic based in London. He is a regular contributor to Art Monthly, Art Papers, Art Review and frieze. Recent publications include Gavin Murphy, On Seeing Only Totally New Things (Royal Hibernian Academy and Irish Architectural Foundation, 2013) and the forthcoming Memory Marathon Catalogue (Serpentine Gallery and Koenig Books, 2014). Posted on April 5, 2014 December 8, 2016 by vsmallfires	This entry was tagged Chris Fite-Wassilak, custodian, East London. Bookmark the permalink.